Do Latter-day Saints Believe in Original Sin? 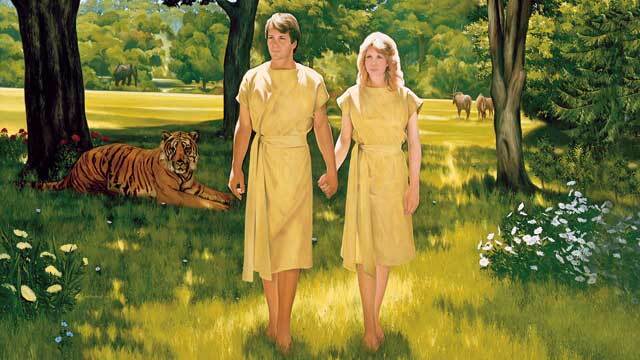 Latter-day Saints do not believe in that aspect of Original Sin. While we do believe we all inherit a fallen nature and the future guarantee of sinning because of that nature, we do not believe we will be held accountable for the decision Adam and Eve made. We’ll suffer the consequences of it (we will suffer death and live in a fallen world), but we believe their sin will not be credited to us. It’s sort of like … if a guy walks up and pokes you in the eye, it’s that guy’s fault, right? Yeah, your eye stings, you’re feeling the consequences of his mistake, but he was the one who poked it. You’re only guilty of the eyes you poke. “Behold I say unto you that this thing shall ye teach—repentance and baptism unto those who are accountable and capable of committing sin; yea, teach parents that they must repent and be baptized, and humble themselves as their little children, and they shall all be saved with their little children. And their little children need no repentance, neither baptism. Behold, baptism is unto repentance to the fulfilling the commandments unto the remission of sins” (Moroni 8:10). We don’t believe babies need baptism, because they haven’t sinned. If that baby were to die, we believe they are 100-percent saved by the atonement of Jesus Christ. That’s what Latter-day Saints believe. If you believe differently, no problem. One of God’s greatest gifts to us, his children, is the opportunity to choose what to believe and what not to believe. But now you know a little more about what Latter-day Saints believe. If you’d like to know more, subscribe to the channel, leave a comment, learn more about our beliefs or talk to missionaries at Mormon-dot-org and keep an eye out for our next “Faith and Beliefs” video coming out next week. In The Church of Jesus Christ of Latter-day Saints children are baptized at the age of 8, which we call “the age of accountability.” Before that age, we believe little children are innocent and their wrongdoings are the responsibility of their parents. We believe they do not yet have the ability to fully discern right from wrong or to understand the steps of repentance until then. People who are mentally handicapped and never reach that ability to discern right from wrong or understand the process of repentance may never need to be baptized. We also believe that children who die before age 8 are not only saved, but they are exalted, and that some people may have been so valiant in pre-mortality, they have only the need to obtain a body in mortality and then proceed immediately to the afterlife. This situation, of course, is a tragedy for parents, but having the knowledge of true doctrine can give us hope. “For behold, this is my work and my glory—to bring to pass the immortality and eternal life of man” (Moses 1:39). Immortality will come to all living things in the resurrection because of the atonement of Jesus Christ. Eternal life is more than salvation to a mansion in heaven, which most people will receive. It is exaltation into the very presence of God in order to obtain a fulness of joy and progress in our own god-like attributes. …little children need no repentance, neither baptism. Behold, baptism is unto repentance to the fulfilling the commandments unto the remission of sins. Behold I say unto you, that he that supposeth that little children need baptism is in the gall of bitterness and in the bonds of iniquity; for he hath neither faith, hope, nor charity; wherefore, should he be cut off while in the thought, he must go down to hell. And I am filled with charity, which is everlasting love; wherefore, all children are alike unto me; wherefore, I love little children with a perfect love; and they are all alike and partakers of salvation. For I know that God is not a partial God, neither a changeable being; but he is unchangeable from all eternity to all eternity. And he that saith that little children need baptism denieth the mercies of Christ, and setteth at naught the atonement of him and the power of his redemption (Moroni 8). “Hence came the saying abroad among the people, that the Son of God hath atoned for original guilt, wherein the sins of the parents cannot be answered upon the heads of the children, for they are whole from the foundation of the world” (Moses 6:54). And lo, he cometh unto his own, that salvation might come unto the children of men even through faith on his name; and even after all this they shall consider him a man, and say that he hath a devil, and shall scourge him, and shall crucify him. And he shall rise the third day from the dead; and behold, he standeth to judge the world; and behold, all these things are done that a righteous judgment might come upon the children of men. For behold, and also his blood atoneth for the sins of those who have fallen by the transgression of Adam, who have died not knowing the will of God concerning them, or who have ignorantly sinned (Mosiah 3: 9-11. “Nevertheless death reigned from Adam to Moses, even over them that had not sinned after the similitude of Adam’s transgression, who is the figure of him that was to come” (Romans 5:14). Who is God, Jesus Christ, and the Holy Ghost? Salvation and Exaltation — What’s the Difference?